Example, 8 Identify the type of “Or” used in the following statements and check whether the statements are true or false: (i)﷐﷮2﷯ is a rational number or an irrational number. 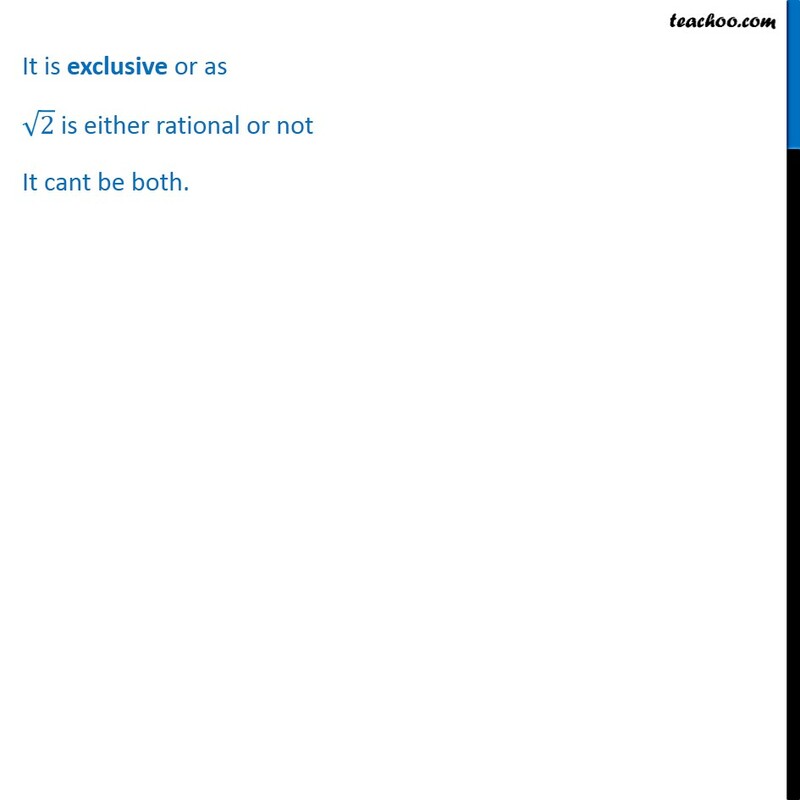 The component statements are p: ﷐﷮2﷯ is a rational number. q: ﷐﷮2﷯ is an irrational number. We know that ﷐﷮2﷯ is irrational number as it cant be Written in form ﷐𝑝﷮𝑞﷯ Hence first statement is false and second statement is true Since the connecting world to ‘Or’ So the compound statement is true It is exclusive or as ﷐﷮2﷯ is either rational or not It cant be both. 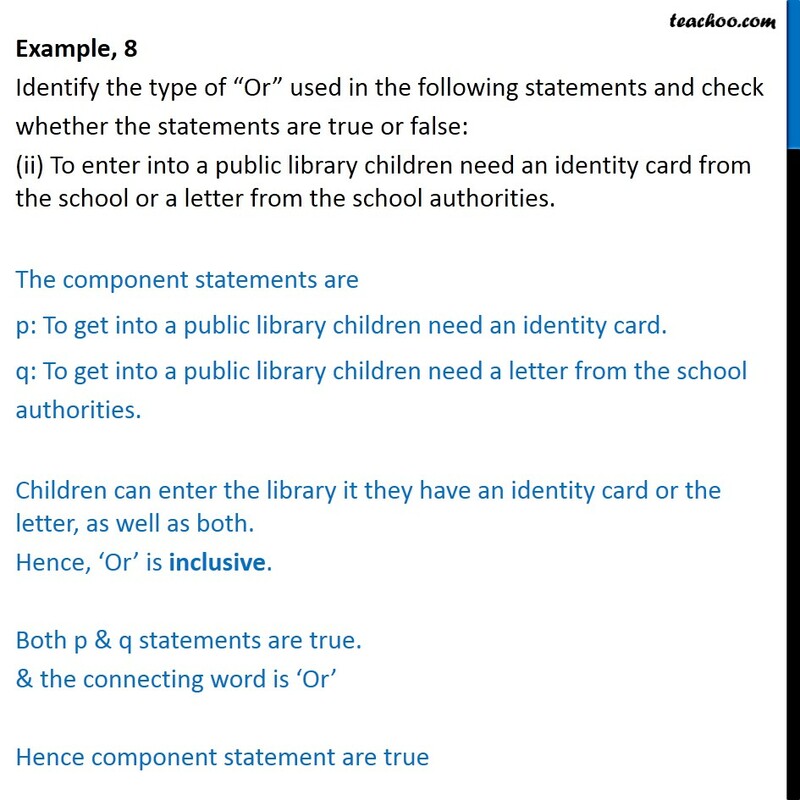 Example, 8 Identify the type of “Or” used in the following statements and check whether the statements are true or false: (ii) To enter into a public library children need an identity card from the school or a letter from the school authorities. The component statements are p: To get into a public library children need an identity card. q: To get into a public library children need a letter from the school authorities. Children can enter the library it they have an identity card or the letter, as well as both. Hence, ‘Or’ is inclusive. Both p & q statements are true. 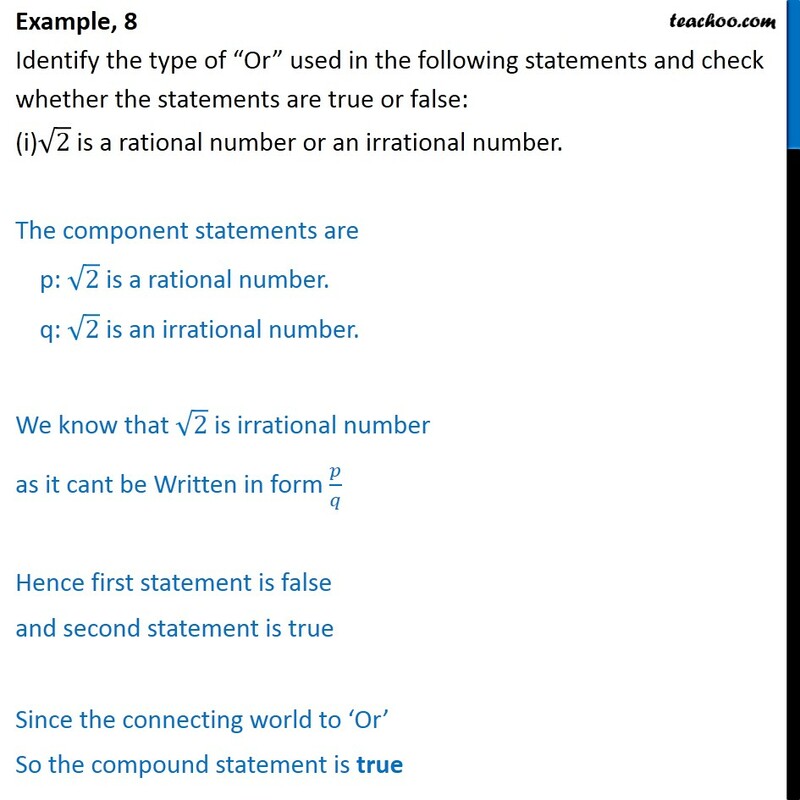 & the connecting word is ‘Or’ Hence component statement are true Example, 8 Identify the type of “Or” used in the following statements and check whether the statements are true or false: (iii) A rectangle is a quadrilateral or a 5-sided polygon. 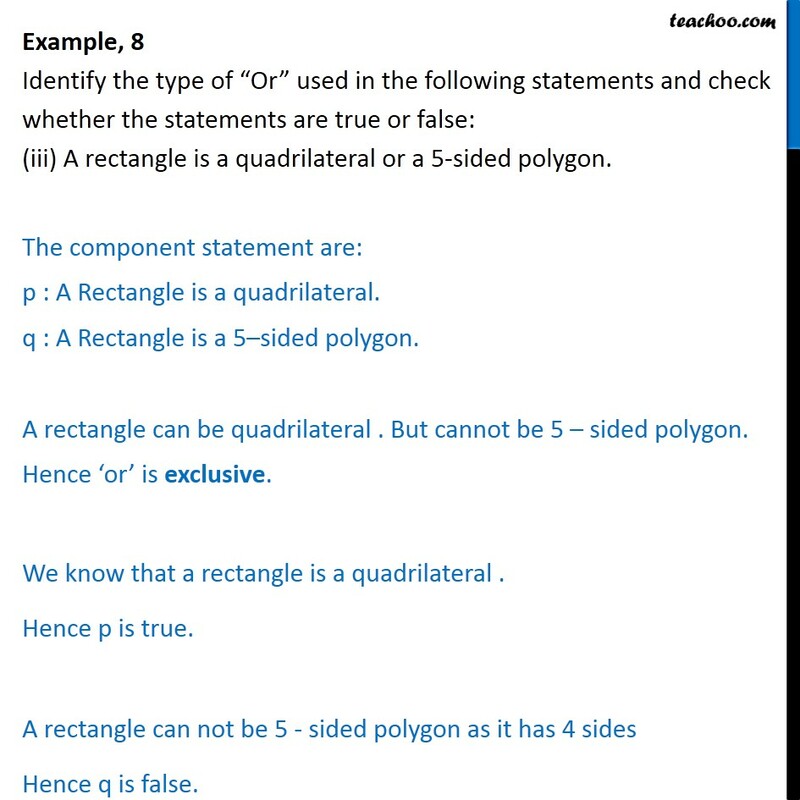 The component statement are: p : A Rectangle is a quadrilateral. q : A Rectangle is a 5–sided polygon. A rectangle can be quadrilateral . But cannot be 5 – sided polygon. Hence ‘or’ is exclusive. We know that a rectangle is a quadrilateral . Hence p is true. A rectangle can not be 5 - sided polygon as it has 4 sides Hence q is false. 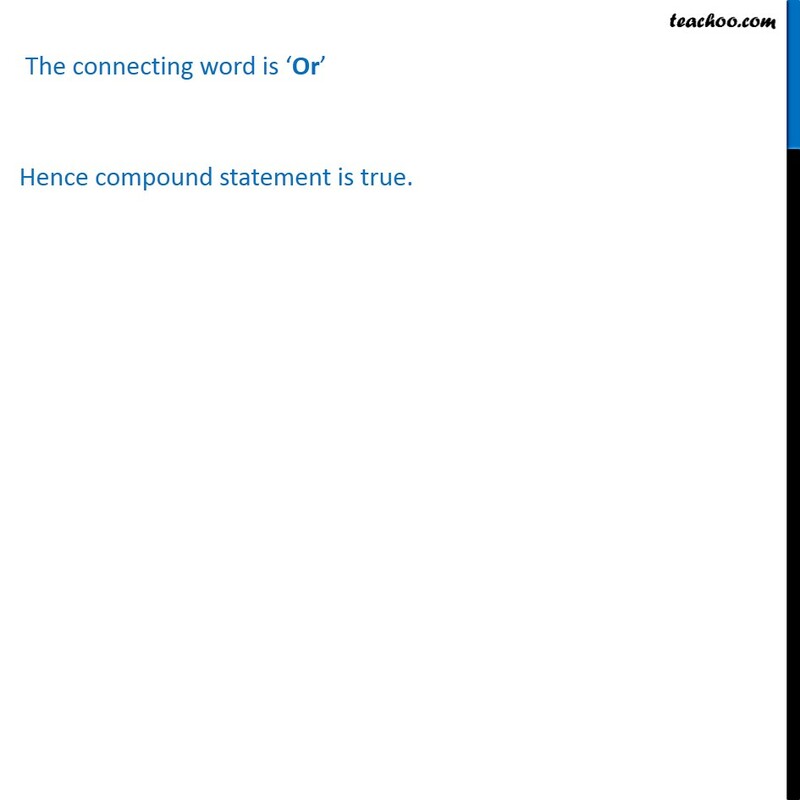 The connecting word is ‘Or’ Hence compound statement is true.